Now that Thanksgiving is over, it’s time to break out the stretchy pants until New Year’s resolutions roll around. It’s the most gluttonous wonderful time of the year! 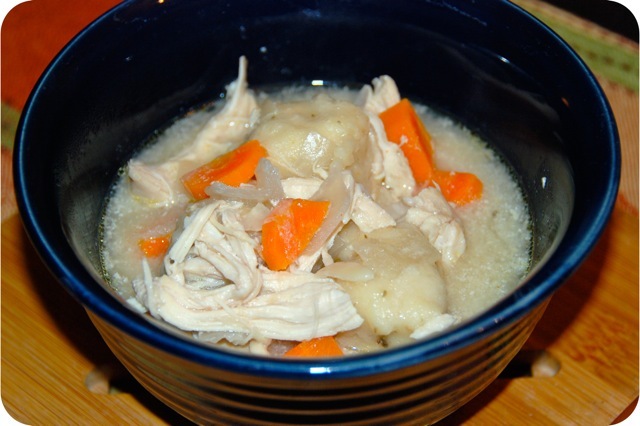 This recipe for Crock Pot Chicken and Dumplings is easy comfort food for a chilly evening of tree trimming or cookie baking, I love the time and attention that slow cookers saves the cook! Nick and I had a great Thanksgiving weekend in Missouri at his Dad’s house! It included lots of food, shopping (for the girls), fishing (for the boys), great times with family and friends, and a super cheesy Christmas light display. 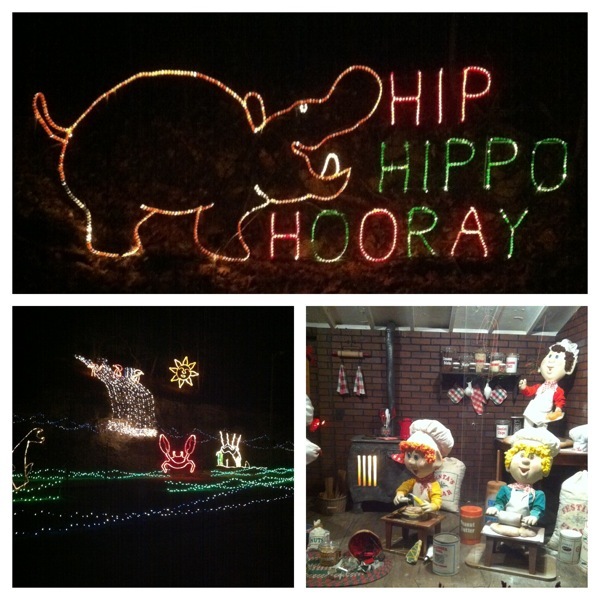 The signs for this place promised an awesome 2.5 miles of Christmas lights and displays. We were super excited when we saw it (well, some of us), and made the boys turn around to go back to it. While idling in line to get in, still brimming with excitement and belting out Christmas carols, we asked one of the nice men directing traffic just how much this little trail of lights was going to set us back. Only $12 per person… wait, WHAT!? What happened to the season of giving?? Almost 50 bucks to drive 2.5 miles?? The guy must have been used to this reaction because he quickly mentioned something about a local discount and shooed us along. Then Operation Rip-Off Christmas began. I sunk down behind one of the front seats and everyone proceeded to pile every jacket and shopping bag in the entire car on top of me, thus reducing our car load from 4 people to 3. It was a steamy hot few minutes, but stifling my laughter when we got to the payment booth was the hardest part. Nick began to babble on and on about being a local. He was pretty convincing in the beginning, but he doesn’t always know when to leave well enough alone and by the time he was handing over cash, I’m pretty sure she had seen through our little ruse. In the end, we only paid $18. I might feel bad about ripping off a Christmas attraction, except for the fact that even at $18, we got the bad end of the deal. I’ve seen neighborhoods put on shows 50 times better. We were sad, but still managed to make it fun. Our trip back to Mississippi was not so fun. It took nearly 24 hours including an unintended overnight stop in Memphis. But I can’t really complain since it was my 7th flight in a year and the first mishap since last Thanksgiving’s travel woes. I guess it’s just a bad time to travel! Anyways, now we are home and I’m back in the kitchen. Place onions, carrots and garlic in the bottom of the crock pot. Season the chicken breasts with salt and pepper and lay them on top of the veggies. Melt the butter in a small saucepan over medium heat. Whisk in flour and cook for 2-3 minutes, until golden brown. Add 2 cups of chicken stock and mix well. Bring to a light boil and cook for 4-5 minutes, stirring frequently. Remove from heat and pour into the crock pot. Add remaining chicken stock, cover and cook on low for 6 hours. After 6 hours, turn the crock pot to high. Remove the chicken from the crock pot and lightly shred it. Stir half and half into the crock pot, then put the chicken back in. Re-cover while you make the dumplings. In a bowl, combine flour, sugar, baking powder, salt & pepper, thyme, sage and cayenne. Crumble in butter with your fingers and rub into the flour until it’s evenly dispersed and coarse crumbs form. Stir in the milk just until a sticky dough forms. Use a tablespoon measure and add small scoops of the dough into the crock pot, starting by placing them around the outside first, then the inside. Cover and cook for another 1-1.5 hours, until dumplings are cooked but soft and not longer raw in the middle. Though I’ve lived in the South(ish) for over 3 years now, I’ve actually never had chicken and dumplings before this! So I didn’t really know what to compare it to. But Nick assured me that the dumplings tasted just like dumplings he’d had before. They just tasted delicious to me! This is definitely a perfect warm winter meal for a chilly day! For chicken:Omit salt and garlic, add one flavor packet from ramen noodles (just toss the noodles) . For dumplings, use 1-1/8 cups Bisquick , adding stated amounts of sage, cayenne, and thyme, and mixed with 1/2 cup milk. Diane: How long would the dumplings made with Bisquick take to get cooked through (covered) if they were not made in a crockpot, but in a soup pot on the stove? Per the recipe on the box, 10 min uncovered in boiling broth and then 10 min covered. I have found they cook pretty well uncovered for 10 minutes then 5 minutes on low covered to keep the pot from boiling over. I have always made them on the stove. 10 mins covered. Then 10 mins uncovered. I love the dumplings the way they are ! Some people don’t like the fakey taste of Bisquik when making something from scratch. Sadly, I can almost always tell when something comes from a box. This recipe is awesome ! I’ve been using the ramen noodle seasoning packets for years–makes for a tasty potato soup, too. 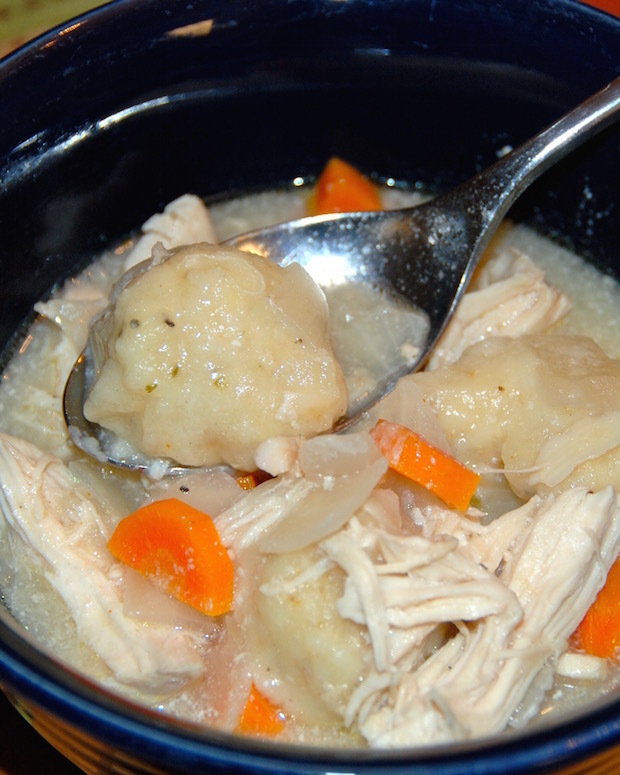 Mmmmmmm… I love homemade chicken & dumplings! Thank you for sharing at the Keeping It Crockin’ Cool Crock Pot Week Link Party! 🙂 Pinned and sharing on my Facebook page later today. My mom always used canned biscuits for dumplings. The cheapest you could buy. No Grands or Pillsbury brands. They just don’t work well. You can’t beat good old Ballard biscuits for dumplings! Sadly, I can’t find them anymore, so I use the cheapest store brand available. Yummy!